Implementation support for questionnaire that is useful to value the efforts on security and safety as well as to set a goal. Although an approach for security and safety has no doubt in necessary, this is also why it is apt to be left unfinished. It is very important to objectively understand the current situation and needs of each approach, to reconsider the goal and to improve the performance. In order to accomplish the improvement, it requires the questionnaire targeting the core of the attempt such as local residents and children. Generally speaking, the questionnaire is designed to be easy to complete. However, when each survey respondent reads the questions with their own interpretation even if the questions are simple, or when they may not find the right choice to describe their answer, the results are not valid. The survey, in fact, requires a careful preparation, and an investigator requires a suitable skill and experience. A key element of the questionnaire design is that it includes setting an evaluation index that is “what and how to ask”. An awareness survey on security and safety requires not only specific items in each fields such as crime prevention, disaster prevention or daily life accidents, but also a comprehensive evaluation such as feelings of attachment or community. A survey in a school needs to understand children’s stage of development as well as self assessment. Studying survey design through various surveys, we summarized the results as the standard questionnaire and decided to publish it so anyone can use it. In addition, in order to respond to feedback received on the site that it is difficult to summarize the results after the survey is done, we created the online tool that supports data input, tabulation and chart making (simple sum up and cross tabulation). A standard questionnaire can be customized depending on the situation at each site. Taking it into consideration that an online questionnaire survey is going to be main stream, we have created a web questionnaire preparation tool that is able to be used with a paper questionnaire. Evaluation of an approach should be done by not only real numbers of attempt and participant, but also changes of participants’ awareness and action. 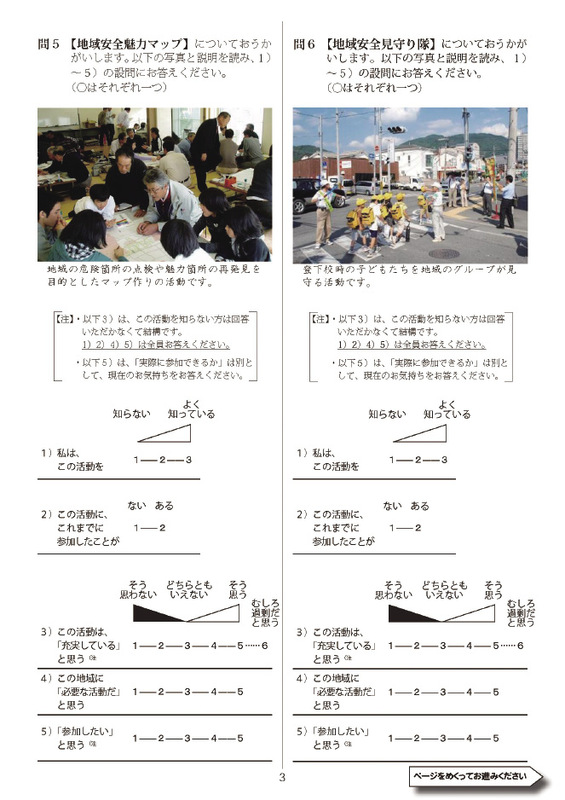 However, the questionnaire to understand the changes is not easy. It requires professional knowledge in designing and analyzing. For a long time we have been conducting an awareness survey, targeting local residents. Based on the experience we have been able to make improvements to the design of our security and safety survey. Based on the knowledge, we invented a support tool for survey design as well as tabulation and chart making after the survey for use by municipalities or schools can use it. Aiming to provide a simple tool which can be used easily by people who do not have professional knowledge of it, we also prepared the material showing key points regarding questionnaire design and aggregation. A paper questionnaire is the base to make the online tool. 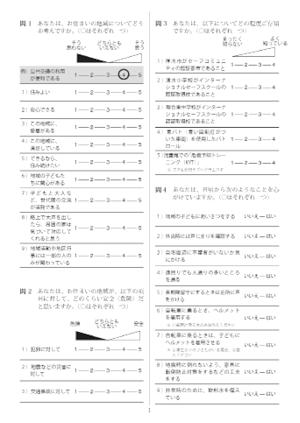 The paper questionnaire is particular about the design that makes easy to choose answers. There are two types of evaluation of an attempt they are, individual evaluation of each approach (relevance, adequacy, necessity, intention to participate), and the effect and impact of the whole approach (including negative effect). Items like regional comprehensive evaluation, that can be the overall goal of the approach have been added. By omitting ambiguous adverbs like, “kind of” or “much” from the point scale answers section and replacing them with clearer responses, such as “I agree – I disagree”, we are trying to have visually clear expressions. To make three kinds of questionnaires, one for the first-year to the third-year students, another one for the fourth-year to the sixth-year students and the last one for junior high school students. The aim for the questionnaire is that children can learn properly and enjoy doing it. ▶To use not only scales but also illustrations that express the meaning of the answer by face expressions or gestures in the answer section. To add questions for self assessment on social skills and emotions like self-affirmation and responsible action, because it is considered that Children’s spontaneous safety activity can affect growth of mind. To add items regarding information technology education and risk management such as the Internet which has recently gathered attentions.